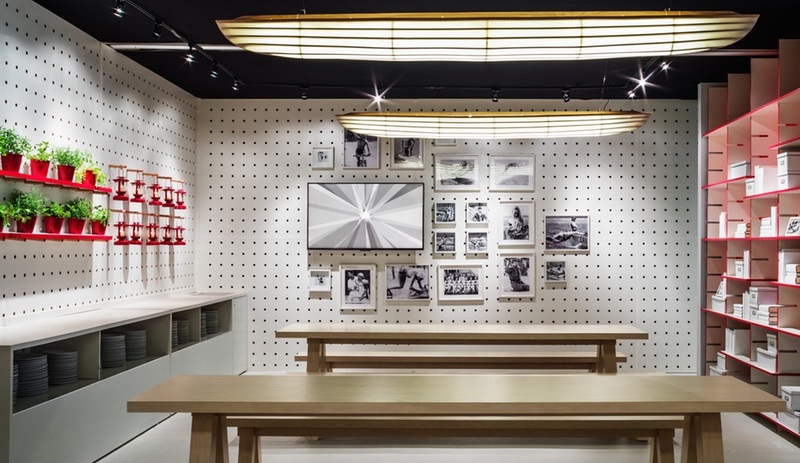 During the 2016 Olympics in Rio de Janeiro, Canadian atheletes will enjoy vibrant and inviting social spaces that channel national identity using readily available objects. 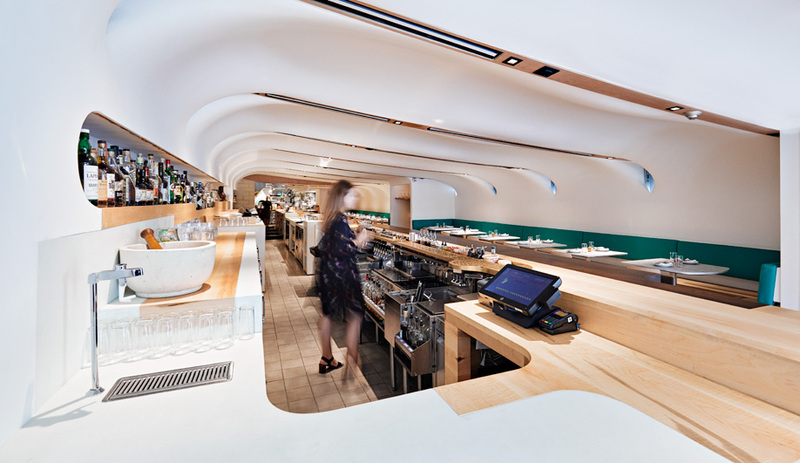 While Toronto interior design firm Yabu Pushelberg is known for its high-end spaces, with a seemingly endless portfolio of luxury boutiques and international hotels, its founders George Yabu and Glenn Pushelberg jumped at the chance to imagine Canada’s presence in Rio during the 2016 Olympics. 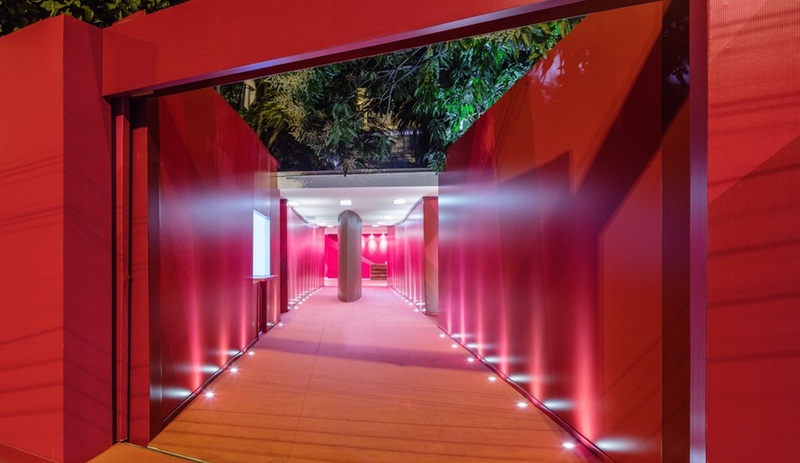 Canada Olympic House, which is in place to host Canadian athletes and their family and friends only for the duration of the Games, grabs attention even before entering, thanks to a striking red gateway. 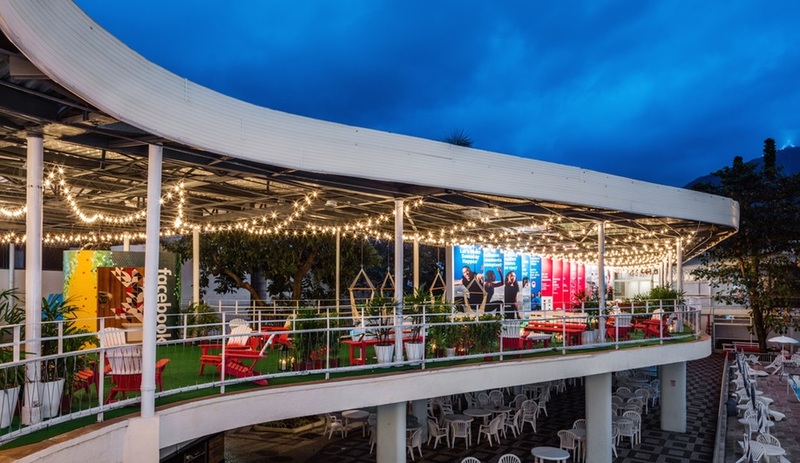 Red, in a specific shade familiar to all Canadians, is used citywide as a signifier for the Canadian team; for the Olympic House interior, it also serves as a wayfinder that draws people into the building (a converted aquatic centre) and to the upper levels inside. 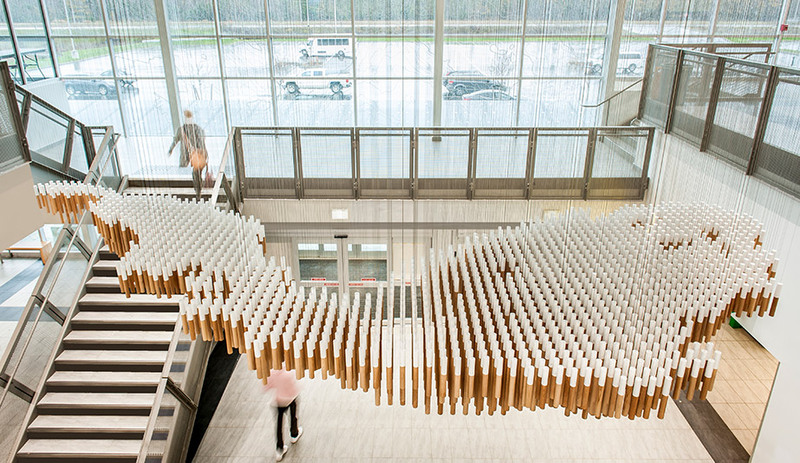 Through the red gate, guests are ushered into a lobby empty except for a log-cabin inspired reception desk and a staircase leading to the second floor. Here, the distinct red is animated with a wall graphic, while white vinyl flooring, also bearing striking graphics, leavens the palette. 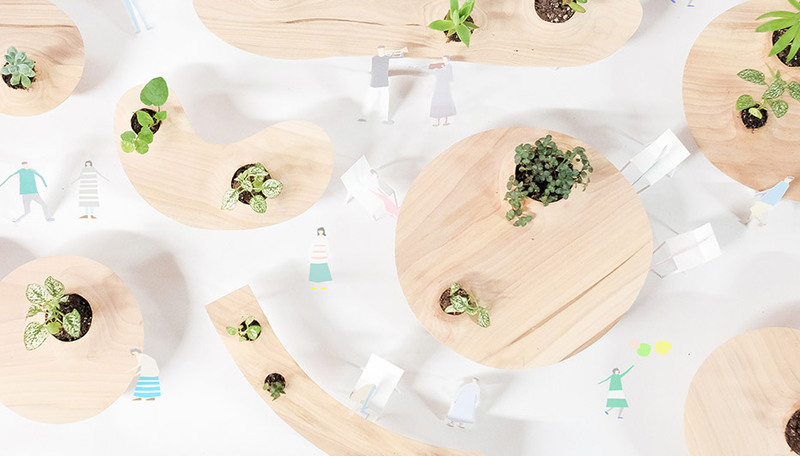 The final touch of red – an installation of hand-painted paddles suspended in a sweeping, kinetic composition over the spiral stairs, by Toronto studio Moss & Lam – directs guests on the final steps into the House. On the second story, the white vinyl flooring’s graphics continue to serve as wayfinding, directing guests to a variety of distinct spaces: a red-and-black retail zone, offset by buffalo plaid carpeting reminiscent of a classic flannel shirt; intimate breakout zones for dining or conversation; and an outdoor terrace dubbed the “Canadian backyard.” To help put athletes at ease in familiar surroundings, YP recreated the archetypal backyard with Muskoka chairs, strings of Edison lightbulbs, log tables, and astroturf – a reference not just to lawns, but also an homage to the field of play for Olympic sports like rugby and soccer. 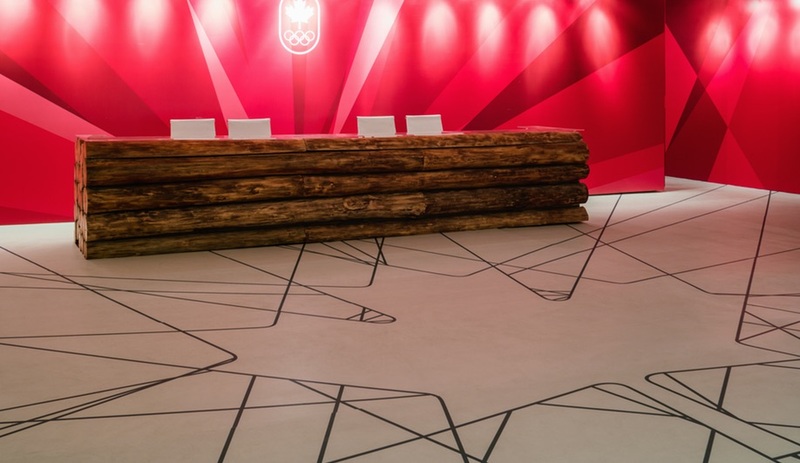 At the heart of it all, tying things together, is the Celebration Lounge, a large, open room that serves as Canada Olympic House’s social centrepiece. 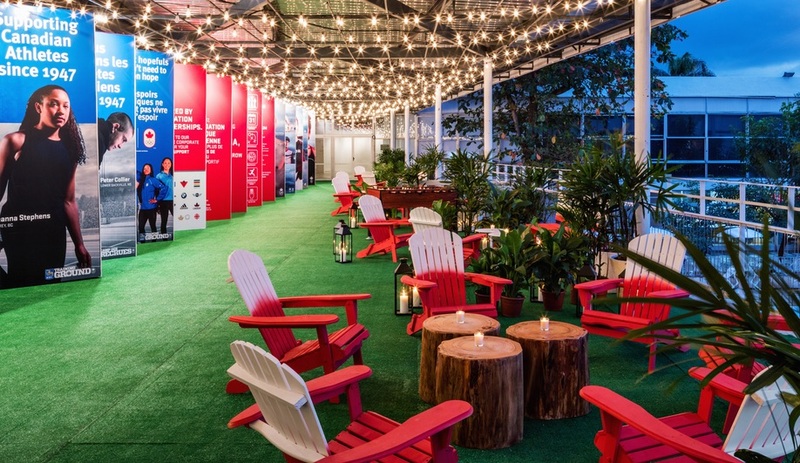 To accommodate a range of activities, YP opted for modular furniture from Canadian Tire’s Canvas collection – versatile ottomans and armless chairs that can be easily reconfigured, all custom slipcovered in matching off-white fabric – with custom plywood and black metal side tables from Quebec’s Saint-Damase. 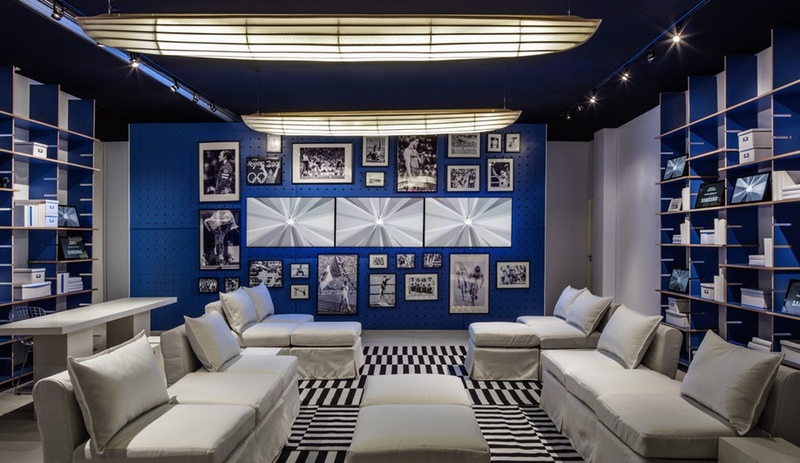 Lining two walls of the lounge are painted plywood bleachers softened with throw pillows, and everywhere, mounted to the lounge’s plywood walls, are television screens to stream the sporting events. 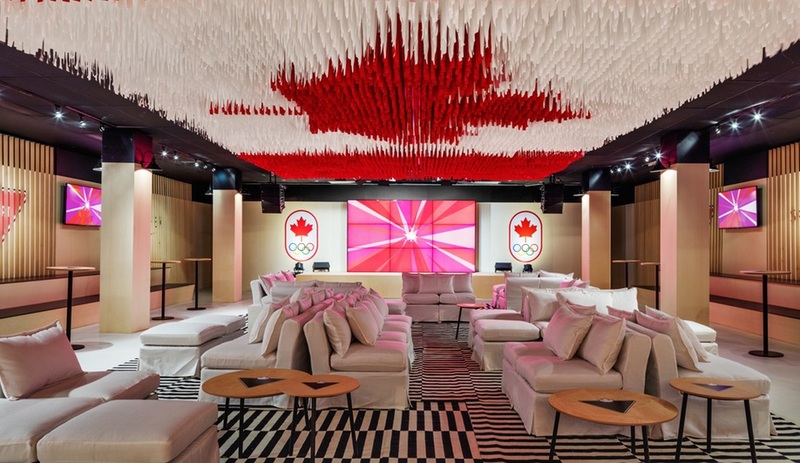 To top it all off, Moss & Lam created a custom installation in the form of a massive Canadian flag that spans the entire lounge. 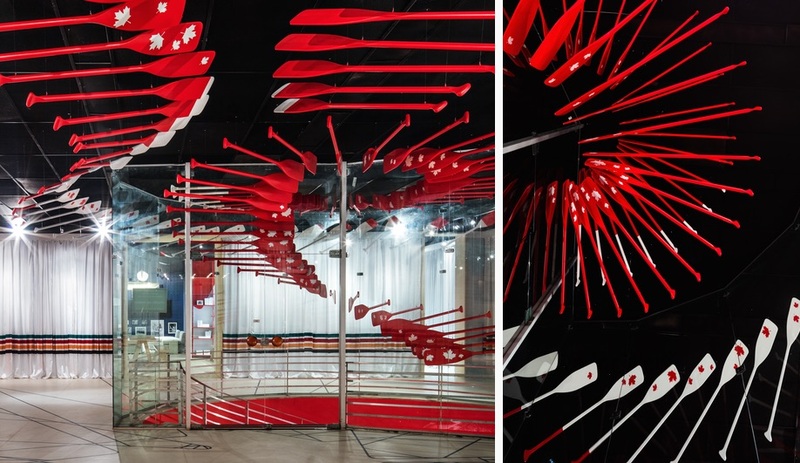 Suspended from the ceiling, thousands of strips of canvas painters’ dropcloth, dipped in red or white paint, assemble to make a powerful reminded of the athletes’ national ties.